Mr & Mrs Blog: The Big Game - You Know, The Super Bowl! The Big Game - You Know, The Super Bowl! As many of you know the Super Bowl was on Sunday! The Broncos and the Panthers were the ones who played. The Broncos were the overall champs. To be honest, I could care less who was playing and who won. What I was excited about was hosting a small.. and I mean small party at our house and being able to have a ton of delicious foods. We invited up the grandparents and watched the game. Well, more like the commercials at least me and grandma. The men might of watched the game but threw in a little nap in between. For the food we had all sorts of things. Buffalo Chicken sandwiches, Soda, Water, Kool-aid jammers, Nacho cheese, salsa, pretzels, nuts, gold fish, grapes, cucumbers and carrots. And of course we had yummy lemon cupcakes! Like I said, we had A LOT of food. But hey the game lasts awhile so why not right? 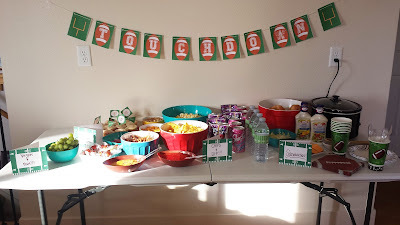 I like being able to throw little parties and decorate so it was a lot of fun for me. Did any of you watch the Super Bowl? If so who were you rooting for? What food did you enjoy? Leave your answers in the comments below! How fun Chelsey that you enjoy throwing parties and such so much! I only like parties because I love to eat yummy food! ha! Like you I could care less who won! I'm glad someone else likes the yummy food part!! :) Thanks for reading my post. UN-boxing: Grandma Sent Me A Package! New LDS Temple & A New Puppy! ?